Unlike cats, dogs and humans, horses’ teeth erupt continuously throughout much of their lifespan although, unlike some rodent species, they are born with a finite amount of tooth to utilise. Evolution has equipped the horse with large batteries of robust grinding teeth, ideal for the horse’s natural feeding behaviour, which is long periods of grazing on tough grass. Unfortunately, those same traits which make horse dentition good for grazing mean that they may not be well suited when domesticated. Stabled horses spend far less time chewing than their free-range cousins, and the feeding of concentrates also alters the pattern of chewing movements. This can upset the natural balance between tooth eruption and tooth wear, allowing sharp or overgrown teeth to develop. Routine dental care seeks to address these problems and can also optimise the performance of athletic horses by improving head carriage and responsiveness to the bit. Your veterinary surgeon is best placed to offer you information and advice on how your horse’s teeth can be properly maintained and arrange for a dental examination. If you are concerned that your horse’s teeth have not been recently checked or may need some attention your first port of call should be your veterinary surgeon who will offer advice, reassurance and a suitable course of action. 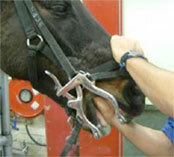 Most horses first have their teeth examined properly prior to breaking-in. How often routine dental checks take place after that varies according to the use to which the horse is being put and their level of performance. A good rule-of-thumb is that the teeth should be examined at least annually but, in some disciplines, checks might be undertaken 2 or 3 times a year. Up until the age of 4-5 years the equine mouth undergoes a lot of change with the shedding of ‘baby’ teeth and the eruption of permanent teeth. Often, dental check-ups are more frequent during this period and settle into a more regular rhythm during ‘middle age’. Your dental practitioner will be able to advise you on a case-by-case basis. 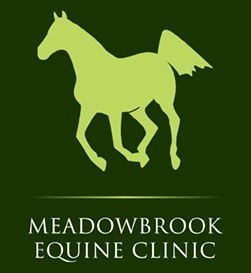 Many horse owners combine the annual dental exam with a general health check and the vaccinations given by their veterinary surgeon. Geriatric horses and those that have previously been identified as having a dental problem are likely to require dental checks every 6 months. Before starting any dental treatment, the dental practitioner will undertake an assessment of the whole mouth. While the front teeth (the incisors) are easy to examine, it is, more often than not, the grinding cheek teeth at the back of the mouth which develop problems. To perform a thorough examination, the practitioner will therefore need to use a speculum, or ‘gag’, to open the horse’s mouth. Once the gag is expanded, the teeth are examined both manually and visually. The teeth at the back of the mouth will always be assessed, as this is where problems often develop. Due to the teeth’s inaccessibility they can easily be overlooked. 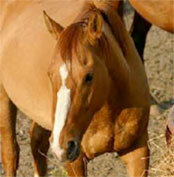 In the adult horse, where all of the teeth have erupted, several common problems can develop. Horses naturally chew their food in an elliptical fashion, with the ‘grinding’ part of the cycle occurring during the sideways movement. In the wild, when chewing forage, the extent of the sideways motion (lateral excursion) is large, covering the whole of the grinding surface of the teeth, including the edges. In domesticated horses this lateral excursion can be reduced, and the horse doesn’t tend to grind right to the edges of the teeth every time. The tooth surface therefore gets worn away quicker than the edges, and these become long and sharp. Because of their angled shape, the outside edge becomes sharp on the upper teeth, and the inside edge becomes sharp on the lower teeth. It is these sharp edges that your dental practitioner will often treat first by a process known as ‘floating’. Floating involves using rasps to smooth any abnormally sharp areas of the cheek teeth. To get to all the different teeth in the mouth a variety of rasps of different angles, shapes and lengths will be have to be employed. Every practitioner has an array of their favourite instruments and their own individual floating routine. In most cases the removal of sharp enamel edges and points will be all that is required during a routine check-up. Occasionally, focal overgrowths of certain teeth may need to be addressed: the most commonly encountered type are ‘hooks’, which usually affect the first upper, and last lower cheek teeth. If there is extensive amount of ‘floating’ to be performed, your vet may choose to use a motorised rasp as this will reduce the amount of time your horse will need to wear a gag. When using motorised dental equipment, it is nearly always advisable for the horse to be sedated first in order to prevent damage to the soft tissues in the mouth if the horse were to move suddenly. There may be occasions where the initial dental examination reveals a more serious problem in the mouth of a horse. Often dental problems will lead to noticeable signs: the horse having difficulty eating or swallowing, a discharge from one or both nostrils, or foul smelling breath. However, if a problem is seen on a routine dental examination, it is always better to deal with that problem before other signs of disease are seen – prevention is always better than cure. Such problems can include an infection of the tooth root, a fractured tooth, a tooth that is growing in the wrong direction, or food packing into spaces between the teeth. Your dental practitioner will be able to advise you on the appropriate course of action. They may wish to refer the case on to a veterinary facility for further investigation. It may be that the problem can be treated in the standing, sedated horse, but occasionally dental disease can necessitate complicated surgery under general anaesthesia and hospitalisation. The most important point to remember about ageing a horse by its teeth is that it is not accurate! In younger horses (less than 10 years old) a reasonable estimate of age can be made by looking at the stages of eruption of the temporary and permanent incisors, and by looking at the incisor tables (grinding surfaces), which change in appearance as the incisors wear down throughout the horse’s life. However, in older horses, estimates of age may be out by several years. In many respects, a horse is as old as it feels, and if your horse is bright, healthy and eating well, you shouldn’t worry when someone tells you that it has the teeth of a forty year-old. They may be many years off the mark!